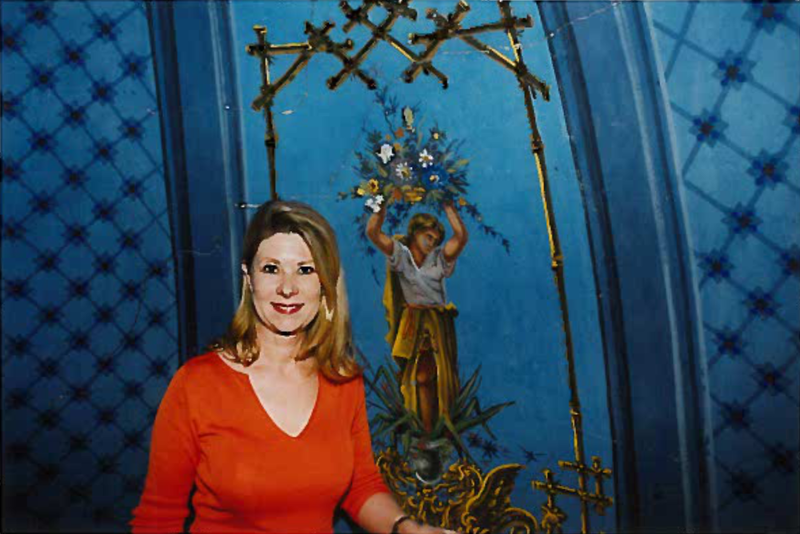 Art Conservationist Stashka Star, of Dallas, completed the restoration of intricate murals at the House of the Seasons, a historic home and museum in Jefferson, Texas, in 2003. Renowned for her restoration of Art Deco murals at Dallas’ Fair Park, Star was hired in 1996 by Richard Collins to restore a sculpture at the entrance to the former Women’s Museum honoring his mother, Calvert Collins, the first woman to serve on the Dallas City Council. 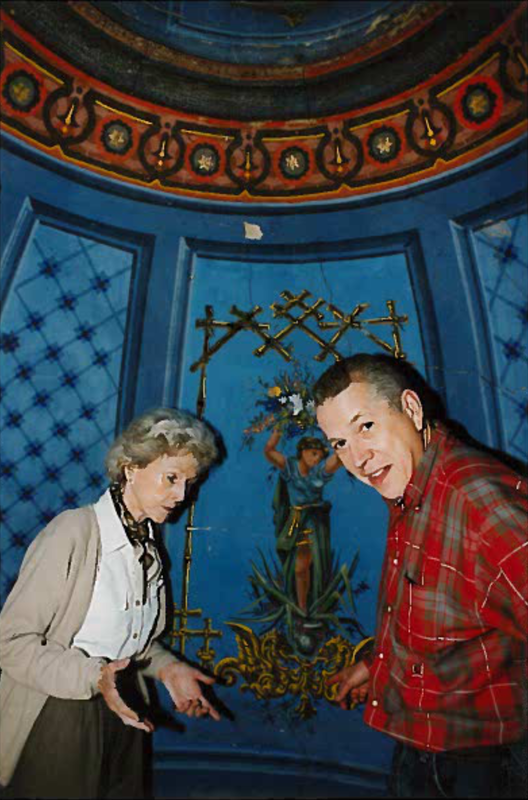 A relationship developed between Star and Richard Collins, who asked Star to repair the murals in the dome of his recently acquired House of the Seasons. 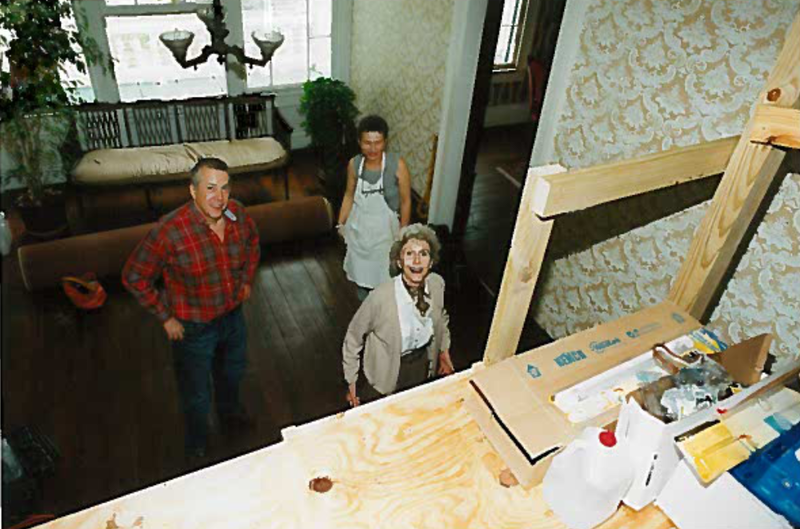 “Stashka’s work on the Women’s Museum sculpture was extraordinary, and she has done a magnificent job to beautify and preserve the murals at the House of the Seasons,” Collins said. Art Conservator Stashka Star discusses with Foundation directors Calvert Collins and Richard Collins the requirements for restoring and safeguarding the 130-year-old paintings in the dome of the House of the Seasons. 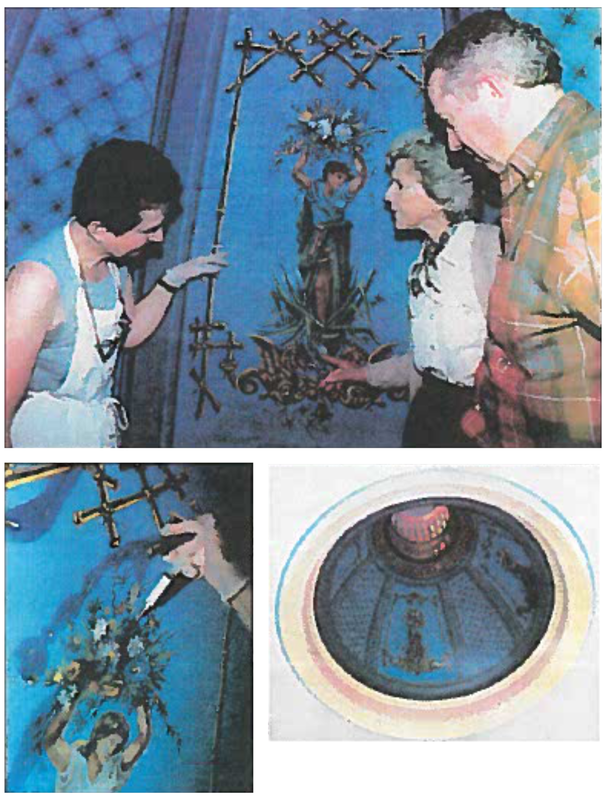 The above photo, left, shows one of the murals as Star’s work began, while the right photo shows her work after completion in the House of the Season’s domed cupola. Star spent seven weeks on the conservation project, delicately painting areas of the artwork that had been damaged over time causing cracking and flaking. 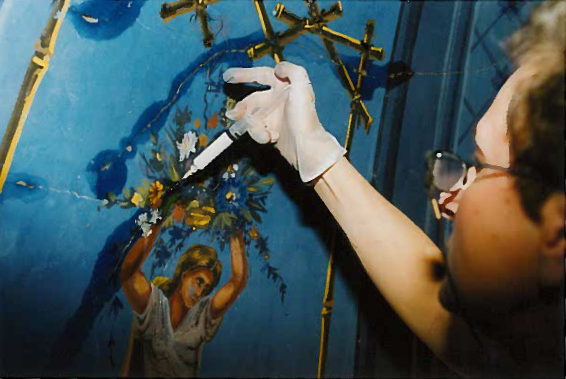 The murals in the dome of the East Texas historic home were cleaned and restored by Star, who then delicately painted areas of the artwork that have been damaged over time from cracking and flaking. After a final varnishing, the murals are more vibrant and are now protected to stand the test of time, according to Star. 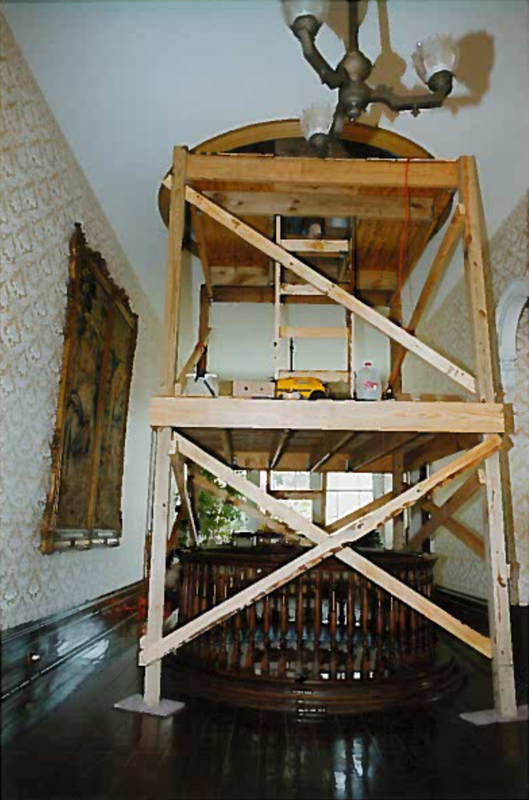 Star spent seven weeks on the restoration project, all the while enjoying the comforts and amenities of the House of the Seasons where she stayed as a guest in the Peach Room (and saw the ghosts). Star holds a masters degree in art conservation from Poland’s Copernicus University. 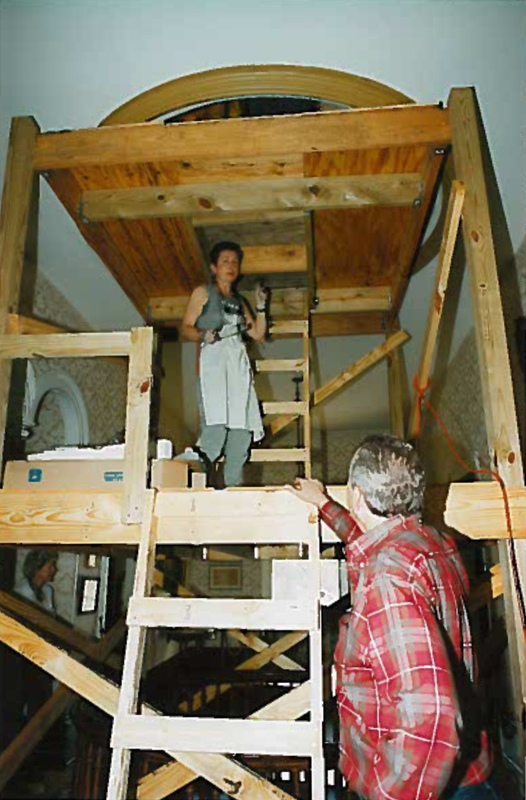 She has 29 years of experience in the conservation and restoration of paintings, murals, and sculptures. In her analysis of the murals prior to conservation treatment, Star reported: “The wooden structure of the dome was sound and healthy. The plaster composed of sand and lime putty was aged, powdering and detaching from the lattice. “The vibrations and shifting of the house caused the plaster to crack and detach from the wooden support. The cracks were open and the surface of the plaster on both sides of most cracks was not level. The original paint was deteriorated and powdering severely. “Parts of the mural were cleaned improperly previously, leaving the paint discolored. In some areas, the paint was flaking severely. “The dust and dirt was mechanically removed from the bottom of the murals and the wooden base. “Murals were varnished repeatedly until the paint stopped powdering. “The plaster was reattached to the wooden support by injection of polyvinyl alcohol 25 percent dilution in water. “The big losses of plaster were compensated with a mixture of sand and lime putty and the cracks were filled with a mixture of whiting and glue. “The fillers in cracks were painted with MSA conservation acrylic paint. “The discolored bottom parts of the two fields were painted to match the original background. Some of Star’s most noted works include restoration of murals and stenciling in the Thistle Hill Mansion of Fort Worth, the Spirit of the Centennial at Dallas Fair Park, many Art Deco restorations there, and the conservation of paintings from the State Capitol in Austin. In 1981, Star fled from Poland to the U.S. in search of freedom and life in a democratic society, and now resides in Dallas with her husband. The couple has two grown children, one who is a doctor, and the other an underwater archeologist.